As the highest point of your home located directly beneath the roof, your attic plays an important role in temperature regulation during the summer and winter seasons. Likewise, if your attic isn’t properly ventilated, you’re likely to encounter a number of issues during especially hot or cold days. As the winter season rolls in with the coming months, you need to facilitate the flow of outdoor air to ventilate your attic, thus reducing the potential for ice damming. Though this seems counter-intuitive, ice damming occurs when snow melts off of your roof due to an attic that is too warm. This snow refreezes at your gutters and causes an ice dam that can damage your roof. Ice damming is a telltale sign that your attic needs more ventilation. Thick ridges of ice on your eaves may form as warm air from the rooms below becomes trapped in the attic. This warm air also carries moisture that condenses on rafters and roof sheathing. Dampness or frost in these areas in the winter means you need better ventilation. In the summer, well-vented attics allow hot air to move out of the attic. This protects roof shingles and reduces moisture buildup. If you touch your ceiling on a warm, sunny day and the ceiling is hot, this means the attic is working like a solar oven, retaining heat and cooking your roof. 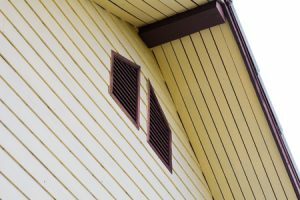 In this case, you should consider adding more vents to the roof and eaves to help improve airflow and reduce temperature fluctuations. Numerous solutions exist for increasing your attic’s ventilation, such as adding roof and soffit vents and insulation baffles. If left unchecked, a poorly-ventilated attic can contribute to mold and mildew growth as well. For attic mold remediation, give the certified specialists at Jun’s Mold Remediation a call to remove mold from your attic and roof. We also offer roof cleaning and roof repair services should you notice other issues with your roof due to poor attic ventilation.